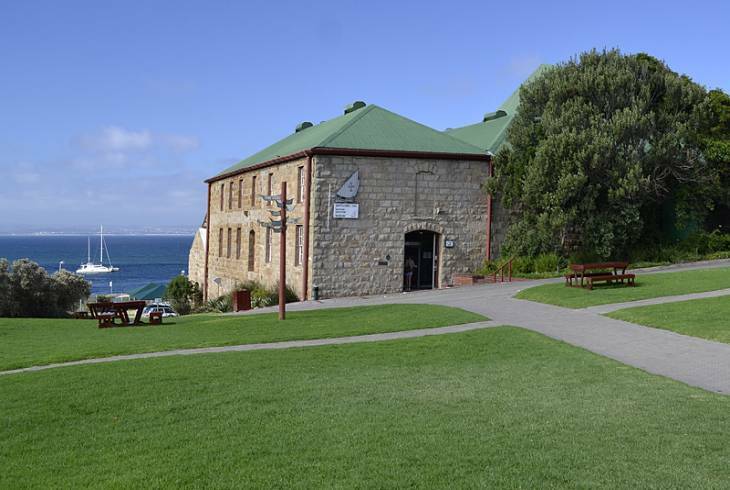 The Dias Museum officially opened in 1989 and is probably the most popular attraction in Mossel Bay in the Western Cape of South Africa. The Museum consists of four different museums and several monuments. A statue of Bartholomew Dias stands outside the famous 500 year old Post Office Tree, which is an old Milkwood Tree used by sailors for the safe delivery of letters. The Shell Museum and Aquarium was built in 1902 and was later incorporated as part of the Dias Museum in 1987. It has an impressive shell collection and displays of creative ways shells were used by man. There is also an interesting "whale and dolphin" exhibit. There are often school groups who enjoy this museum and aquarium, especially for the interesting "touch tank" where visitors actively learn more about the underwater sea world. The Maritime Museum was built in 1901 as a grain and saw mill but later also became part of the museum where a life size ship was built. This exhibit is the replica of the Dias caravel and visitors may board the ship for an exciting and historic tour where you will learn about Bartholomew Dias' voyages which has made the Western Cape so famous. Bartholomew Dias Museum Complex and the Shell and Maritime Museum Information and Nearby Accommodation.